Since 1976, Cassese has been revolutionizing the world of framing. First, by inventing the wedge & underpinner for joining frames ; and then a few years later, inventing the flexible point. Today Cassese still remains the preferred choice in over 120 countries for engineering the highest quality underpinners, choppers, double-mitre saws and back fastening robots. Cassese continues to invest in developing and engineering more innovative and patented products aimed at helping improve the quality and productivity, of all framers big and small, whilst meeting and exceeding all the latest safety requirements around the globe. So when it comes to providing your customers with the best possible craftsmanship : trust the best, trust Cassese. Mr Antoine CASSESE, Inventor (1927 – 2018). In 1976, Antoine Cassese invented the wedge to join frames (also called « V-nail ») which was going to revolutionize the picture framing industry all around the world, by reducing drastically the time required to make a frame. Indeed, until that date, picture framers needed to pre-drill, glue, nail, then refill nails’ marks and re-color or re-gild carefully the mouldings in order to erase all marks of the joining. The « V-shaped » wedge (« V-nail) invented by Antoine Cassese was from now allowing a joining from underneath the moulding. The joining was now perfectly invisible and did not require anymore pre-drilling, nailing, nor re-coloring or re-gilding of the moulding. In addition, the shape and technical properties of this revolutionary wedge was now providing a much more efficient and powerful tightening of the corners than the one so far provided by simple nails or wooden keys. From now on, the V-nail was allowing to manufacture a picture frame in a few minutes, or even a few seconds at contract framers, whereas the complete process could take several hours in the past. This productivity gain was going to democratize and convert into a mass consumption product, what was so far considered as a luxury product : the picture frame. Antoine Cassese also invented the first frame assembling machine, also called « underpinner » or « V-nailer », and the 15mm and 25mm flexible points. 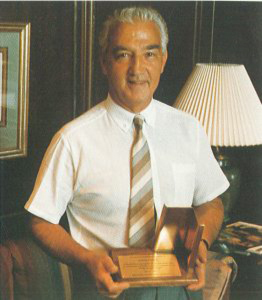 Mr Cassese received PPFA’s “Award of Recognition” in Dallas in July 1986. This award, an enlarged version of the pin (v-nail) used in the Cassese joiner, is made of metal with an inscribed brass plate thanking Cassese for his contribution and service to the picture framing industry.